But unlike a Notre Dame defense, I’m up to the task. I was hoping to get to attend my first Pac-12 game of the season Wednesday but it’s my pal’s birthday and so the two Bay Area games will likely be taken in peripherally. I don’t know what elements of mayhem this birthday celebration will get us in to but it can’t get much wilder than a monitor review in Tucson (still too soon?). Anyhow, at the time of this writing (Tuesday night) I was tied with UCLA for number of road games played at zero. Yeah, you read that right. UCLA hasn’t played a single away game this season and while their trip to Houston to play Texas could be considered semi-road, the paltry 2,797 attendees barely qualifies it as a game, tree-noise-forest. Regardless, Ben’s Boys are winners of seven straight and somewhat surprisingly unranked after beating Missouri amidst that streak. Game of the Weekend: The nod easily goes to Arizona’s first trip into Matt Court. Indeed the Wildcats have never played upon the trees and are winless against the Ducks as members of the Pac-12. I even read a tweet that a Vegas book keeper thinks this will be Arizona’s first loss. That, my friends, is a recipe for intrigue. And then getting down to it, these are two teams that match up pretty interestingly. Both squads spread things out pretty evenly as Oregon has six players scoring 8 or more points per game and Arizona has five such stand outs. Both make a concerted effort on the defensive end and while Arizona finds their way to victories on the perimeter (38% of shots from three at a 38% make rate), the Ducks are going to come at the Cats in the paint (just 29% from deep at a 31% clip). STATS! This game is ultimately a battle for momentum in a Pac-12 battle that is Arizona’s to lose. And I’ll be damned if winning don’t matter for something. Following my discussion with ATQ’s Dave and Matt, I’m excited to see what a bumping Matt Knight experience looks like as those two ducks confirmed for me that this is the biggest game to hit that tree’d court since its inception and the since Dana donned the sidelines in Eugene. Game to Avoid: Call me a Pac-12 homer but this is a tough one. I can derive story lines in just about every single game but that’s probably just because I’m the preeminent Pac-12 hoops blogger out there(?). Ha, that was arrogance stolen from Lost Angeles who’s moved on to Bachelor recaps (hilarious) after a disappointing USC football season. But seriously, eye balling the weekend there isn’t anything grossly abysmal but I can’t not (yes, double negative) look at USC’s visit to Salt Lake. These two teams combined for 12 wins last year and, for lack of a worse term, that’s god-awfully-tragically-rock-bottom. But a season removed from that crap, these two haven’t done too much to shift our thinking. Good on the Utes for already surpassing the six-win mark as well as their morally victorious trip to the Grand Canyon State. The Utes are on their way up from a really low, low. Meanwhile, the 6-9 Trojans have disappointed even though they’ve played the 10th toughest schedule in the nation. I can try and pump these two as formidable foes but until either one does something to boot the homer talk and get legit, there ain’t much to discuss. Something to Prove: The California Golden Bears. Are they elite, average, or poor. It’s like Goldie Locks’ damn porridge bowls, and beds; I can’t tell if these guys are good, average, or bad. On the one hand, they have some tremendous talents in Allen Crabbe and Justin Cobbs. On the other, they can’t hold home court against Harvard; who may be an up-and-up program but who should not beat a Mike Montgomery team on its home court. So this weekend, when the Cal Bears host arguably the easiest of any of the travel companions, anything less than a sweep would be time for panic and the start of a dialogue I’m keeping an eye on: What to make of the Monty-in-Berkeley-era? As I’ve said, we’re very early in the season and I could see Cal being remarkably competitive with a consistent Ty Wallace, but they’re not there yet and they really should be. This weekend will be their best opportunity to prove they mean business. Something to Lose: This early in the season, I can’t say there is a ton at stake but the Stanford Cardinal have a lot to lose this weekend. I’ve long thought of them as a sleeping giant in this improving Pac-12 and they’ve done little to make me believe they’re vastly improved from last season’s 26-win, NIT championship squad. Frankly, I think this team is a lot better than they’ve played to date and while they own competitive losses to Mizzou and NC State, they also wear losses to Belmont and USC; schools that have combined for two BCS victories including Stanford’s loss at USC. To this point, I’m too high on the Cardinal’s pieces to imagine they need to fight their way back into the mix but their 0-2 start doesn’t exactly instill confidence before they host a less than intimidating Washington faction. Anything less than a sweep for the Cardinal and I have to imagine the rest of the season’s games become must wins. Yeah, we drop “must win” in week 2 at PacHoops. USC has a lot to look forward to this year and it has become somewhat of a national dialogue as they return a whole new look from last year’s injury debacle. Demon Deacons – The Trojans welcome two former Wake Foresters in JT Terrell and Ari Stewart. Terrell has the bigger upside with regards to immediate impact as he’ll be asked to light it up from distance; something he certainly can do. The Keck School – In case you’re unfamiliar, that’s USC’s medical school. A place that’s now nursed Jio Fontan, Dewayne Dedmon, and Aaron Fuller back to health. That’s a lot of injured talent the Trojans were missing last year and now regain. Sweat – KO has repeatedly called this the hardest working group he’s ever coached which is saying something considering the demanding nature of KO-ball. And, as we’ve learned from an early age, hard work usually translates into success! Shoulders – I’m not talking about Aaron Fuller’s now healthy ones. I’m talking about the chip on the collective Trojan shoulder. KO has referenced it and one has to believe that any group cast off as many times as this patchwork lineup has been, would likely have an axe to grind. Or a chip on their shoulder, pick your cliché. Two – That’s the number of conference games they’ll need to win to improve on last season’s total. Hey! Baby steps. Quack – Another shot at the Ducks! Too soon? Lottery – KO once called Dewayne Dedmon a future pick by a team on a Ping-Pong ball. His 2011-12 campaign was shortened by knee injury as the seven-footer continues to learn the game. 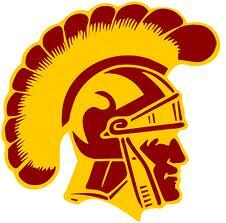 If in his time off he’s pieced together a little more basketball acumen, look out, the Trojans just might live up to their rebuilt hype.